Media & diplomats are calling Afghan president Hamid Karzai’s refusal to sign the Bilateral Security Agreement (BSA) to maintain US military occupation in Afghanistan “The last stand of Hamid Karzai;” they liken it to a poker game, deplore he is “thumbing his nose” at the US & demonizing US troops & diplomats, accuse Karzai of mental health problems & ask if he is off his meds–all because he demands a minimal semblance of Afghan sovereignty, including accountability in Afghan courts for US soldiers who commit crimes & cessation of barbaric attacks on civilians. Karzai is no prize package politically; he is a long-time collaborator with the US-NATO occupation & came to prominence only as a result of his corruption & collusion with the US. He will be leaving office after the April elections so his new independence may reflect some opposition within the Afghan elite to continued US occupation. It takes a certain amount of courage for Karzai to defy the US because if they thought they could get away with it the Pentagon would not hesitate to take him out. The appropriately named US ambassador Cunningham (since he is both sneaky & a ham actor) said “It flies in the face of logic & morality to think that we would aid the enemy we’re trying to defeat,” & he accused Karzai of “deeply conspiratorial” thinking. Not really ambassador CunningHam. Karzai doesn’t have to go all libertarian; he only has to look at Iraq & Pakistan to see the future of Afghanistan. 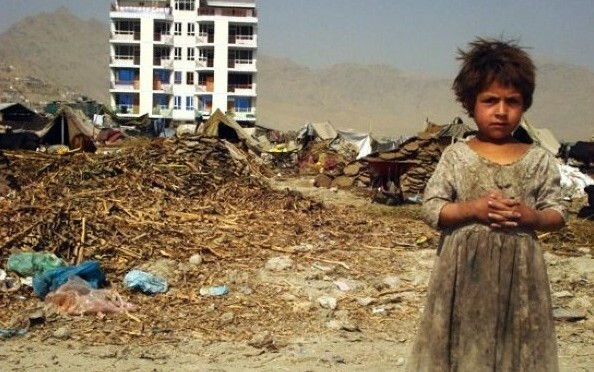 Poverty statistics in Afghanistan are quite staggering: according to one of the endless UN reports, nine million Afghans or 36% of the population live in “absolute poverty” while another 37% live barely above the poverty line. The streets are lined with homeless widows & their children begging. The poverty line established as $1.25 a day by the World Bank wouldn’t feed a mouse, let alone a child, so the distinction between absolute poverty & those barely above the poverty line is only one a sociopathic bureaucrat would make. But most importantly, can the UN tell us how those women were made widows & their children homeless? Has the bubonic plague hit Afghanistan & carted off all the men? Or might the US-NATO war be implicated in the massive poverty?